When a tooth has become badly decayed or becomes infected, a root canal is used to repair the tooth. Although there are benefits of having this procedure, many still choose to have their tooth extracted or continue to live with the pain. But why are so many people afraid of having a root canal? The main reason people tend to stray away from the procedure is due to the number of myths and misconceptions surrounding today’s root canals. Put your mind at ease by checking out these 5 debunked myths surrounding root canal therapy. This is probably the number one misconception people have about getting a root canal. However, with advances in technology, the procedure, and anesthetics, many patients feel little to no pain during their root canal procedure. Some have compared having a root canal treated to getting a filling. There may be a small amount of soreness or discomfort following the procedure and after the local anesthesia wears away. However, this is considered to be normal in many dental treatments of this nature. There are many reasons why people choose tooth extraction over having a root canal. For some, it is the cost of a root canal without insurance. Others believe the myths of extreme pain during the procedure. However, the main reason many patients choose extraction is because they have been told that root canals are only a temporary fix, and they will need their tooth extracted eventually. The truth is root canals are highly successful at saving your teeth and root canal treated teeth can last a lifetime with proper care. This is a big one. There are many people who believe that root canals are the cause of cancer and other illnesses. This couldn’t be further from the truth. There have been many studies over the years that have proven this to myth to be wrong. 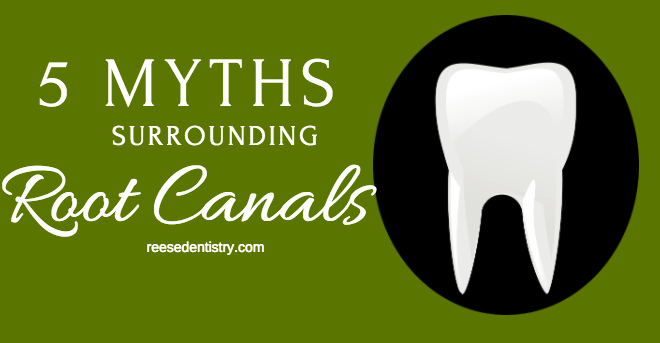 In fact, the myth about root canals causing cancer is over 100 years old. Many root canal treatments can be completed within one to two office visits. At Reese Family Dentistry, Dr. Reese utilizes the latest nickel-titanium rotary instruments that enable him to perform root canals in a single visit. While it is true that a painful tooth may be an indication that you need a root canal, it is not the only factor that a tooth needs work. When you visit your dentist, x-rays are taken and teeth are examined carefully. If there are any signs of an infected or damaged area, a root canal may be suggested in order to save your tooth. DON’T WAIT ANY LONGER. CALL REESE FAMILY DENTISTRY TODAY! If you have been told that you need a root canal, then you shouldn’t put it off. Putting off this procedure only makes things worse. Teeth will become more sensitive to hot and cold foods and eventually you will start to experience more pain in the area of infection or damage. And if you have never had a root canal, then keep brushing twice a day, flossing, and visiting the dentist on a regular basis. The best way to prevent a root canal is to take care of your teeth. Give Reese Family Dentistry a call today at (870)424-5900 or click here to REQUEST AN APPOINTMENT online.